Child Protection Initiative ~ The Toronto Hare Krishna Temple! 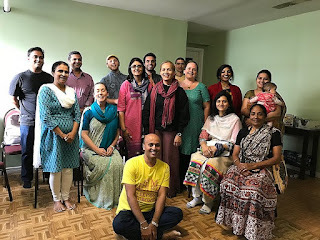 On a sunny Saturday in September ISKCON Toronto hosted a Child Protection Awareness training for devotees serving with the greater Toronto area centers including Scarborough, Toronto, Brampton and the newest addition, Milton. Management, Child Protection Team members and youth serving staff spent the day increasing their understanding of the various forms of child maltreatment, red flags and practicing how to respond when someone reveals a concern. Practical ways to enhance safety for children at their respective centers was a significant take away from this event. Perhaps you have noticed ways your temple is making changes to increase safety for children? If you are the caretaker of a young child coming to the temple, to ensure a safe and positive experience for all, the primary thing that you can do is arrange adult supervision for your child at all times. On Sunday the CPO gave child protection presentations to the congregation in Brampton as well as Toronto. Old and young from diverse populations expressed gratitude for the straight forward and preventative approach to this universal issue that effects so many. Today I was searching for event lighting toronto then read this awesome content which has lot of helping material.